Had a terrible experience with my online order which was placed on Sunday, 1/6/2019. I placed an online order for 2 medium pizzas and 2 orders of chicken wings at 4:05 pm and was promised a pick up time at 4:50 pm. When I entered the store, I was told by the manager named "Rambo"( it was probably a made up name)that my order wouldn't be ready for another hour, atleast and there were many people ahead of me. I was livid because we had people at our home watching the football game and they were hungry. I went back to the store at 6:05 pm and waited on a long line. When I got to the counter I was told by the manager that my order was cancelled. I would never cancel my order and was " fuming". The manager had 2 pizzas ready but they were burnt to a crisp and was told that the store ran out of chicken wings. The manager wasn't respectful and treated me poorly. People waiting on line was told the same thing... a long wait ahead of them. 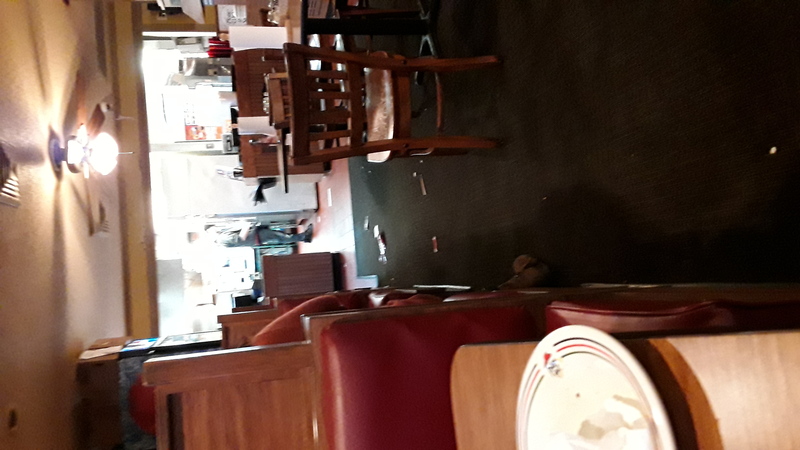 I regularly ordered from this Pizza Hut location and this has been the worst experience ever. I only ordered 1 pizza and got charged for 2. I called the store and the manager was very rude and said it was my fault. This isn't the first time either it's every time I've ordered from the location in New Haven, Indiana. 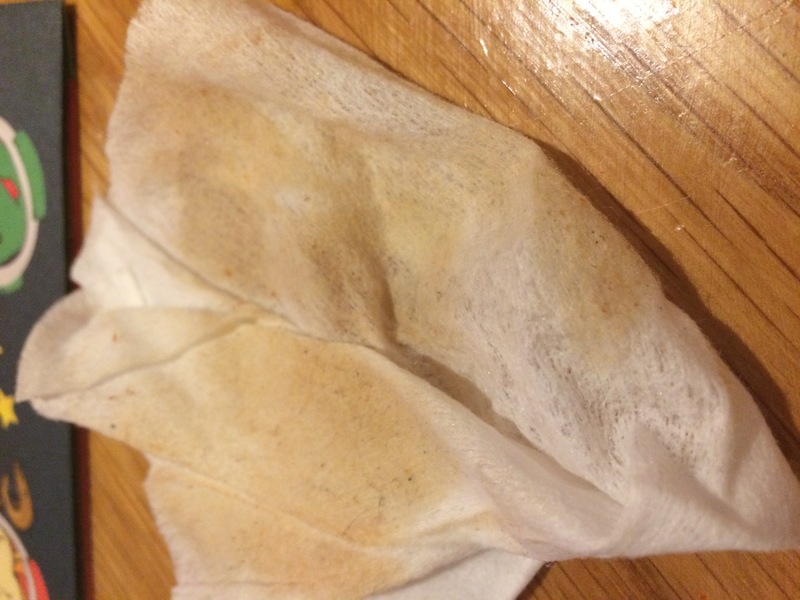 On February 16th I had a very negative experience with the Pizza Hut in Heber City, Utah. We ordered 6 pizzas for delivery 4 hours prior to the delivery time. 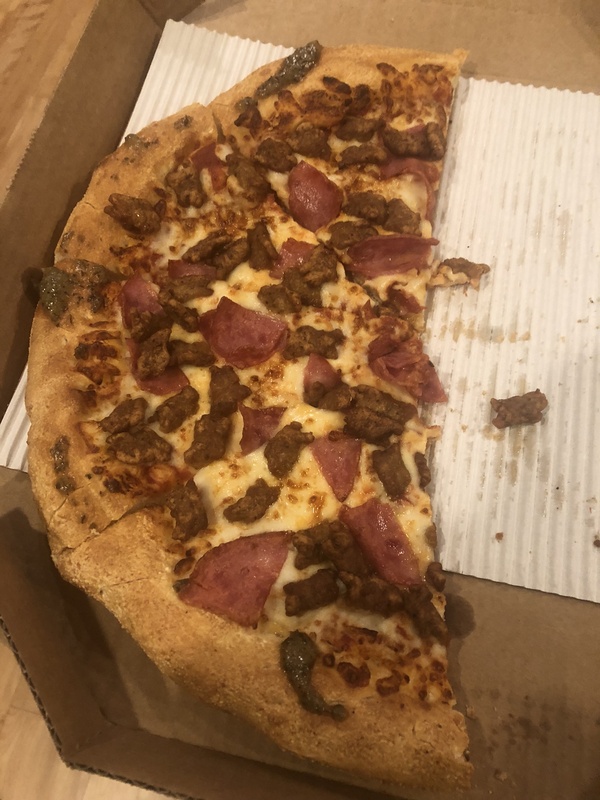 When we were first delivered the pizzas (they arrived late) and there was no large supreme pizza (instead a smaller one topping pizza we didn't order), my sister called Pizza Hut and asked them if they could bring the correct pizza. They said they couldn't get in touch with their dispatcher so our only options were to give us a $10 store credit (which isn't even as much as we paid for the pizza) or we could come in to pick up the pizza. So she said we would come in to pick up the pizza right away. I drove the 10 minutes to pick up the pizza. When I got there the employee at the front asked for the name for the order to which I gave him the name and explained that I was there to pick up our pizza they made a mistake on. The employee looked up the name and then went to the back to ask about the order He was standing behind some metal shelves (which I could hear and see through) and told a lady back there that I was there to pick up my pizza to which she replied “We’re too busy. We can’t make it. 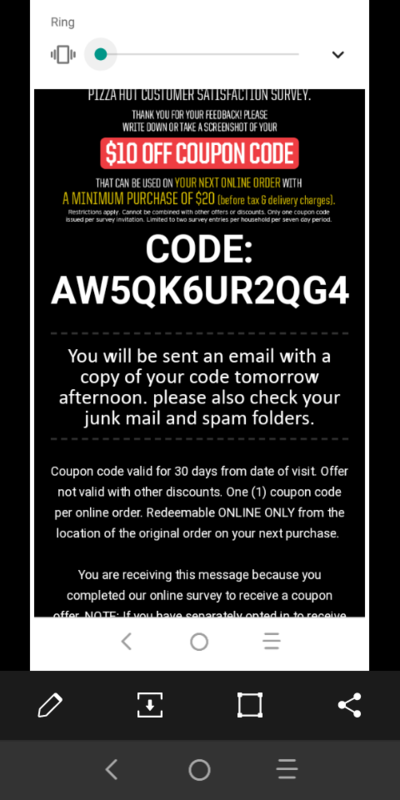 Tell her we will just give her a $10 credit.” He came back out and explained to me that they hadn’t gotten to making it yet and that I would need to come back to get it later or they could give us a $10 credit on our account. I explained that I didn’t want the credit, I wanted the pizza that I was told I could pick up right away. 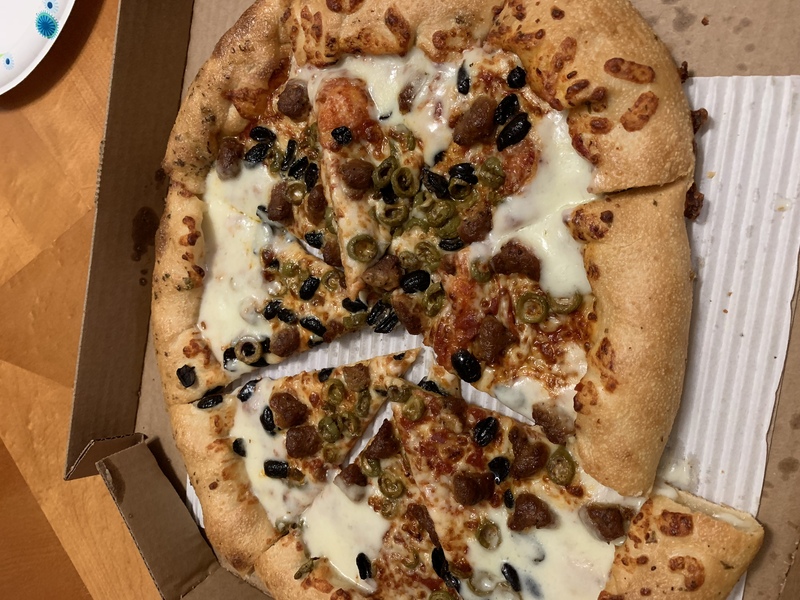 I said that since it was their mistake and I had come all the way in only to be told that I didn’t have a pizza, I thought it was only fair that they make the pizza and have it delivered. 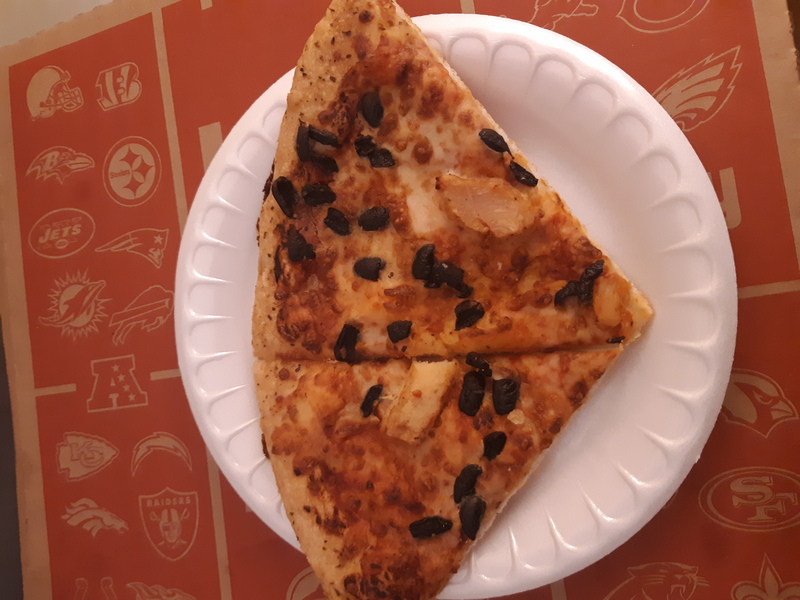 The worker then went to the back to explain to the lady that I had asked that they deliver the pizza since they told me I could pick it up to which she said “I already told her we would give her the f*****g credit. WE aren’t making her a f****** pizza!”. It was at that moment that I spoke up and said to them in the back “Excuse me. I can hear everything you are saying. If you have a problem come out here and talk to me to my face but don’t talk to me with that language.” Immediately the front employee and another man came running out front and told me I needed to “bring it down” and “calm down”. I got very frustrated and said “Do not tell me to calm down. Your employee is the one who is raising her voice and using very inappropriate language.” He said “she’s actually the manager here. We’ve been so busy that she hasn’t slept for over 48 hours and that’s why she said that.” After much talk, the man agreed that they would make the pizza but they would not deliver it to me. Instead he said I could pick it up in 30 minutes (they made it clear that delivering it was not an option). I went back 30 minutes later, was completely ignored by all the workers and after waiting 30 more minutes, went home without the pizza. When I arrived home without the pizza my sister called Pizza Hut again. They acted very apologetic and said that she would make the pizza herself and have it delivered right away. She double-checked the address and we waited for the pizza. Two hours later, the pizza STILL had not come, so I called again. By that point, we had gotten other food so we no longer wanted the pizza, we just wanted a refund. I called and explained that we had still not gotten our pizza after four hours of trying very hard and doing everything they said in order to get it. He said they had the pizza right there, and I said that at this point we no longer wanted it, we just wanted a refund since it had been 4 hours. He said that the problem with doing that would be that he would have to refund our entire order. I suggested that he do that since they had put us through such a hassle for four hours trying to get our pizza. Upon suggesting that, he got extremely hostile and started yelling at me over the phone. I'm not exaggerating when I say yelling. He said that although they were "partially" to blame, they had been very swamped that night (as though that was my fault). He literally screamed the words "the customer is not always right!" (I promise if you have a recording of this call you will hear this). Upon being screamed at in this manner and generally treated so rudely, I told him to just go ahead and give me the store credit, but that $10 did not even cover the cost of the pizza, which was $17. In a very condescending manner, he said "fine, I'll make it $17. Is that good? "I said it probably been a little more with tax but that was fine. He responded in very snotty voice saying, "fine, I'll make it $18". I can't underscore how much his tone with me was rude, snotty, and down right hostile. 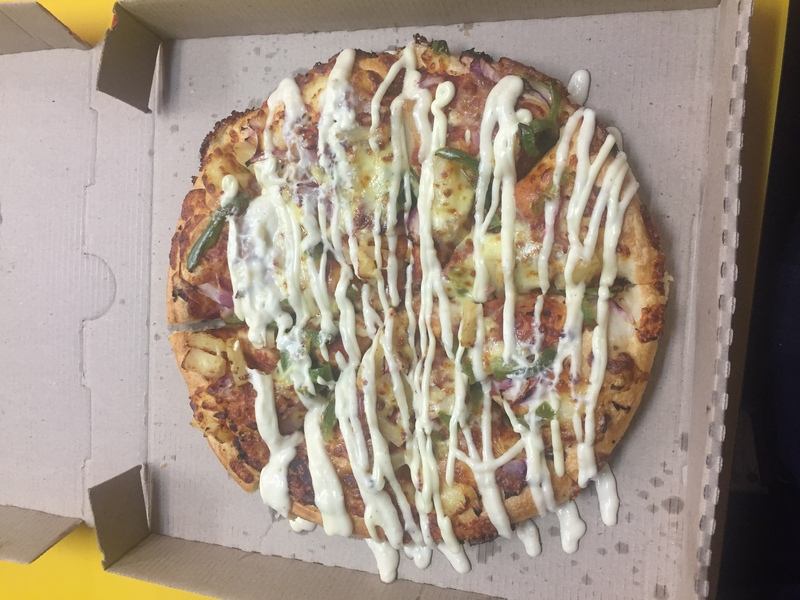 At the end of the day, what needs to be understood is that we ordered a pizza that was never delivered or made for us when we went to the extra trouble to pick it up. 4 hours later, the store still refused to give us a refund on the pizza we paid for. On top of this, we were treated incredibly rudely and unprofessionally through the entire experience, being blamed as if it were our fault that they were so busy. Although we were given store credit, it really doesn't help the fact that we didn't get our pizza. 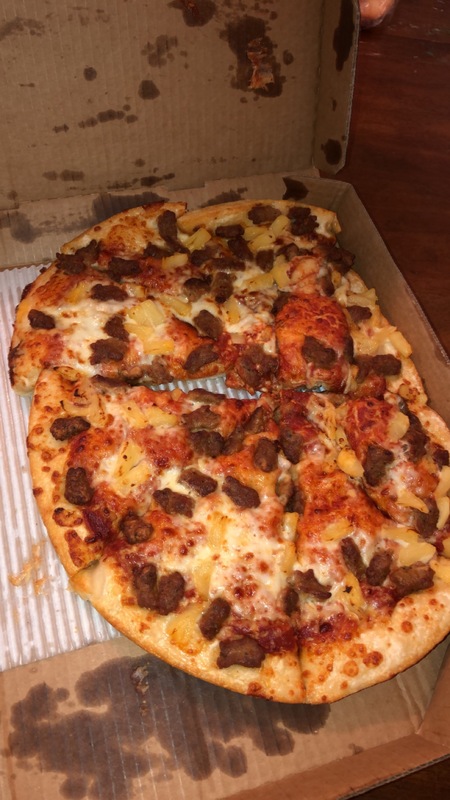 Our aunt paid for the pizza, and she lives on a small island in the pacific where they don't have pizza hut so she is never going to get her money back. And after an experience like this, who would ever want to return to Pizza Hut again? 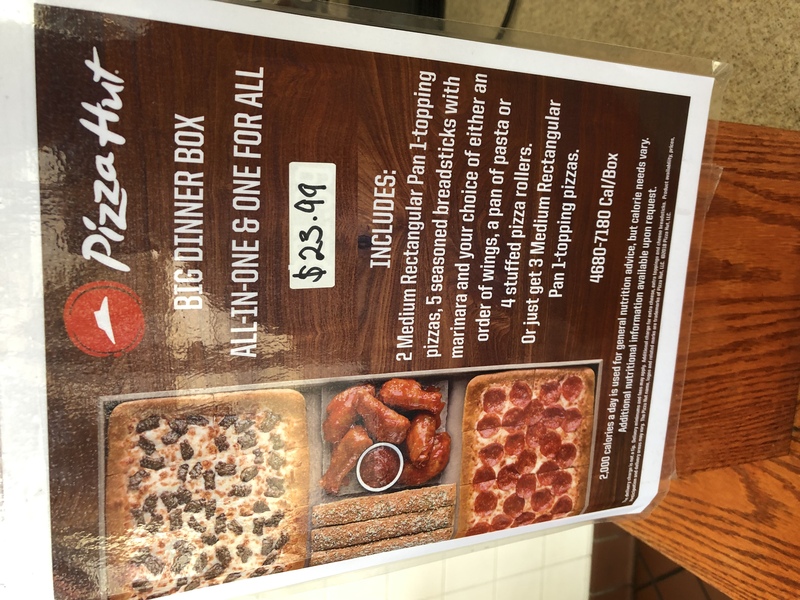 I just ordered from this Pizza Hut and I had to go and pick it up and had to wait for a insult to Pizza Hut name. 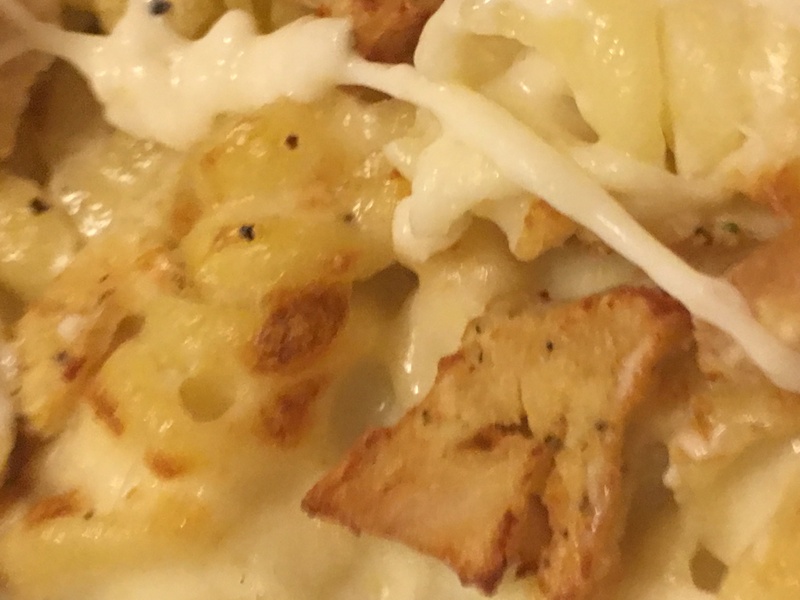 This food ruined my night. I’m still on the phone with them as I write this email. They are trying to get me to hang up it’s a shame for these people to run a Restaurant in your name . 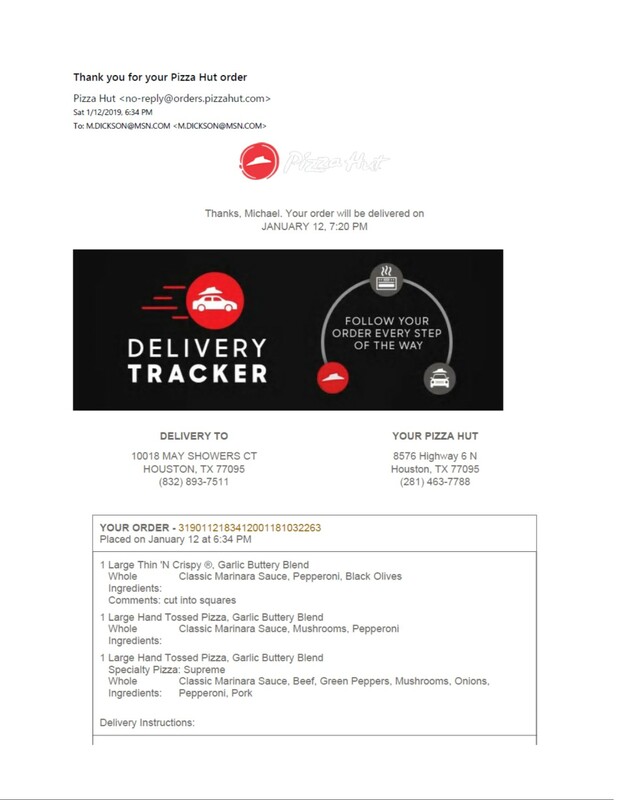 On March 6, 2019 at 6:02 P.M. order (order #319030618025800258001333034240) a pizza online, before the pizza was delivery I inform the manage by phone that I only had a $50 dollar bill. The pizza was deliver cold and the delivery driver didn't have change had to give the driver $3.00 over my bill. This service was sad. 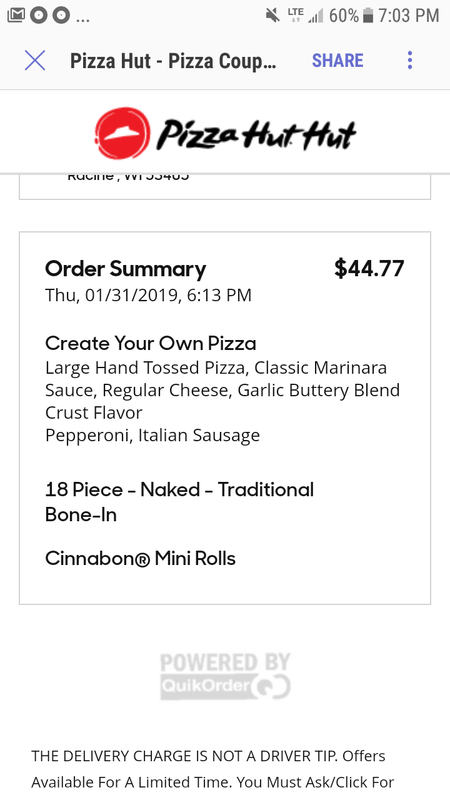 I placed an online order at 8pm on 03/06/2019 with a time for delivery was 85-95 minutes. 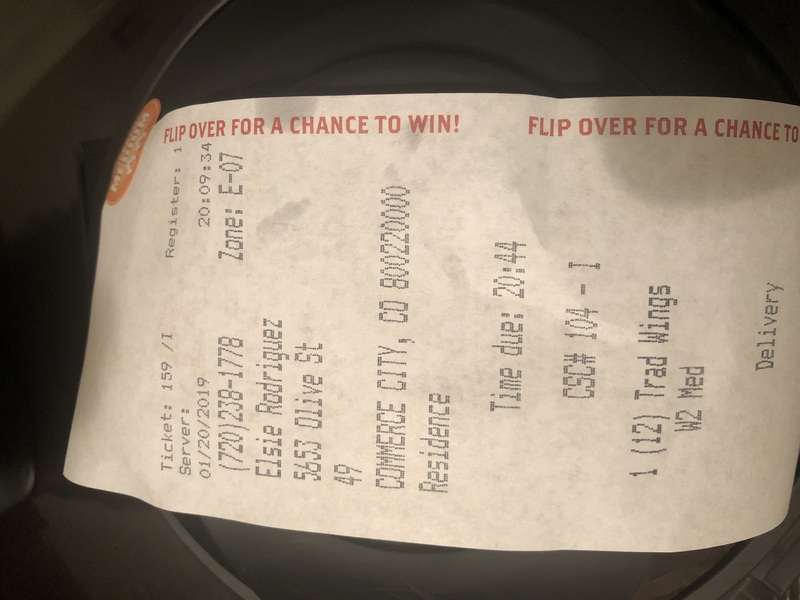 I called about the timeframe at 9:50 pm and was told by Alvin that the pizza was only 18 minutes late it should be on its way at 10:07 pm I called back and spoke with Alvin and the supervisor name Shelby on duty she advised me that the order would be cancelled. At 10:17 pm I received a phone call from the driver stating that my order was outside. I then advised the driver that the order was cancelled over ten minutes ago. I didn't get an apology or anything I have been in customer service for 15 years and that was beyond unprofessional. 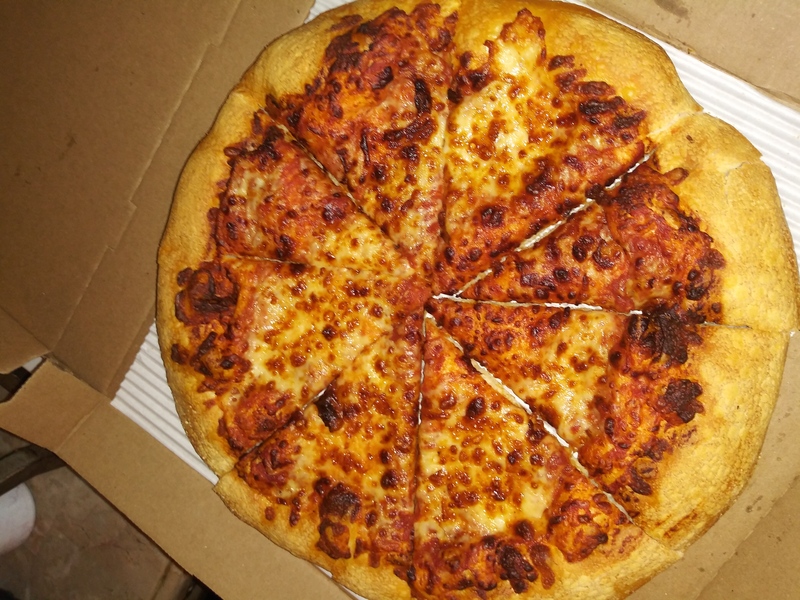 I ordered a pizza a week ago and received my order from the same location that looks like the pizza was dropped with a hole in the order and the cold wings. 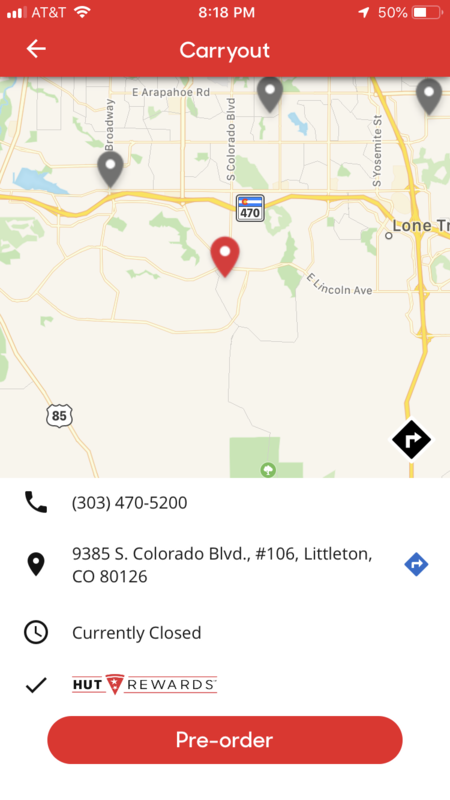 Every time I order from this location I have an issue or concern about my order. Customer Service at its worst.